According to the NY Times, yesterday was a good day for Tesla. Even with the current economic downturn, Telsa has been able to get a commitment of another $40m from their current investors. While most of these investors are super wealthy, I'm sure they've all experienced significant drops in networth over the last month or so. Personally, I'm excited to hear about this. I'm scheduled to get my Tesla Roadster this month. [Update: Telsa is delivering slower than expected. They now say December.] I ordered (and paid for) my Roadster in August of 2006. I've been anxiously awaiting it ever since. I was initially told I might get it by December 2007. 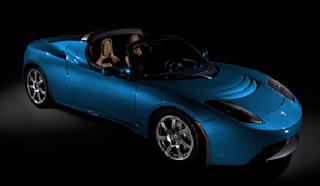 Frankly, a 1 year slip seems understandable for a complex product like the Roadster. (Remember Microsoft's Longhorn delays?) I love the idea of electric cars. When I was a kid, my dad bought an electric riding lawnmower. It was so cool to mow the grass without all the noise. (And boy, did we have a lot of grass.) Back in the 1990s I test drove the EV1 and was tempted to get one, but the 70 mile range didn't seem practical. Hopefully, this next month I'll finally get an electric car, one that gets 220+ miles on a charge and can hit 60mph in less than 4 seconds. Tesla Motors, keep that faith!